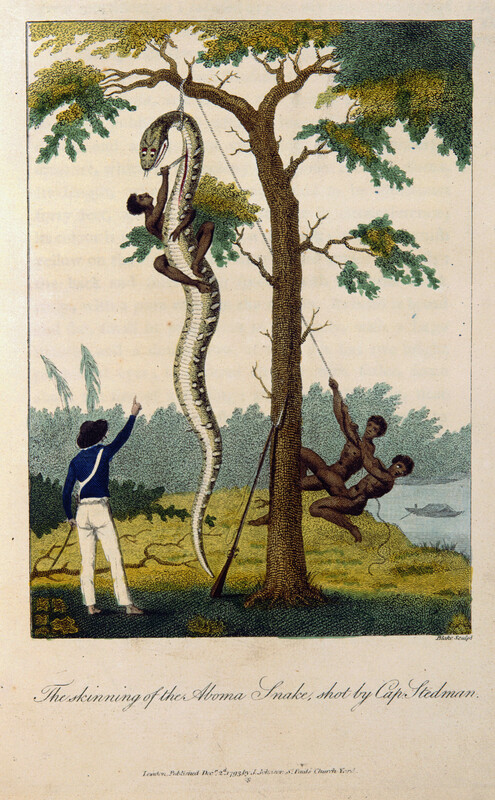 The William Blake Archive is pleased to announce the publication of an electronic edition of Visions of the Daughters of Albion Copy H, in the Rosenbach Museum and Library, and the republication in full searchable mode of Blake’s sixteen engravings in John Gabriel Stedman’s Narrative, of a Five Years’ Expedition, against the Revolted Negroes of Surinam (1796). We are presenting two versions of these plates, one with the designs uncolored and one with the designs hand colored. Visions, extant in eighteen complete copies, consists of eleven relief-etched plates executed and first printed in 1793. Copy H was produced in Blake’s first printing session and joins Copies a, A, B, C, E, I, and J (1793), F (c. 1794), G (1795), and O and P (c. 1818), previously published in the Archive. 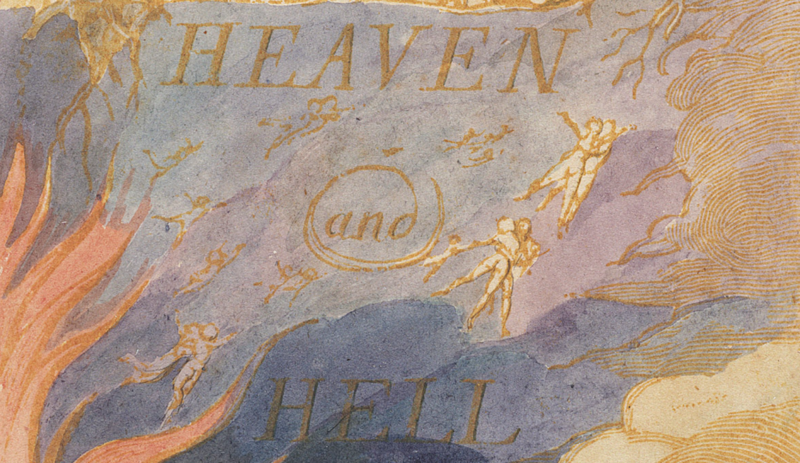 Probably to lend variety to his stock of copies on hand, Blake used three ink colors in this first printing: yellow ochre (as in Copy A), raw sienna (Copies B, C, and E), and green (Copies H, I, and J). Like all early copies of Visions, Copy H has the frontispiece printed on one side of a leaf, but all other plates are printed on both sides of five leaves. In Copy H, the embossments of the platemarks into the leaves can be seen from both sides of the leaves. Examples of the full leaves for plates 2 and 10, included as Supplemental Views in the Show Me menu, lower left under the plate images, show how the plates were registered to the leaves. Blake began work on the Stedman plates in 1791. Stedman visited Blake in June 1794 and subsequently the engraver helped the author with various business matters, very probably including negotiations with the book’s publisher, Joseph Johnson. Blake’s attitudes towards slavery and colonialism were indebted to Stedman’s autobiographical narrative, as is particularly evident in the texts and designs of his illuminated books Visions of the Daughters of Albion and America, both dated 1793. 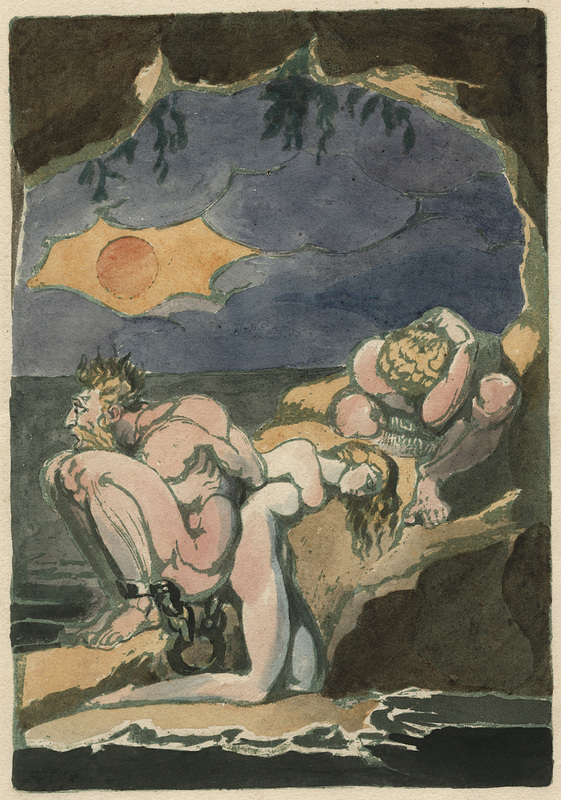 Stedman’s relationship with a female slave, Joanna, may have influenced Blake’s complex representations of gender and sexuality. With the publication of Visions Copy H, the Archive now contains fully searchable and scalable electronic editions of 87 copies of Blake’s nineteen illuminated books in the context of full bibliographic information about each work, careful diplomatic transcriptions of all texts, detailed descriptions of all images, and extensive bibliographies. New protocols for transcription, which produce improved accuracy and fuller documentation in editors’ notes, have been applied to all copies of Visions in the Archive. With the Archive’s Compare feature, users can easily juxtapose multiple impressions of any plate across the different copies of this or any of the other illuminated books and, with the Virtual Lightbox, users can examine images from any genre side by side, as well as crop, zoom, and juxtapose them for close study. In addition to illuminated books, the Archive contains many important manuscripts and series of engravings, color printed drawings, tempera paintings, and water color drawings, including illustrations to Thomas Gray’s Poems, water color and engraved illustrations to Dante’s Divine Comedy, the large color printed drawings of 1795 and c. 1805, the Linnell and Butts sets of the Book of Job water colors and the sketchbook containing drawings for the engraved illustrations to the Book of Job, the water color illustrations to Robert Blair’s The Grave, and all nine of Blake’s water color series illustrating the poetry of John Milton.